Tinordi wears 24....which is strange. This past summer the Penguins signed defenseman Jarred Tinordi to a two way contract worth $500,000 at the NHL level. Jared Tinordi is one of those names of players that sticks in the head for some reason, but why? Sure, Tinordi was Captain of the London Knights when they won the 2012 Ontario Hockey League title, but again who cares about major junior? On January 15, 2016, Tinordi had the dubious distinction of being traded to the Arizona Coyotes in exchange for Victor Bartley and John Scott in an attempt to keep Scott out of the 2016 All-Star Game. Remember that? I sure do. Later in 2016 while with the Coyotes, Tinordi got suspended for 20 games, without pay, for violating the terms of the NHL/NHLPA Performance Enhancing Substances Program. After serving out his suspension, Tinordi couldn’t crack the Coyotes roster (ouch) and has been banished to the minors ever since. The Montreal Canadiens selected Tinordi with the 22nd overall pick in the 2010 NHL Entry Draft. Like all first rounders, Tinordi at one point was highly valued by NHL teams. The Habs actually traded up to get him. Years of riding the bench and being shuffled up and down between the NHL and AHL didn’t help Tinordi’s development. When Tinordi was given brief opportunity to play in the NHL, he didn’t perform. The Habs aren’t exactly an NHL team that is known for their player development, so Tinordi’s true ability as a potential NHL is still entirely up in the air. Currently the 25 year old Tinordi has played in only 53 NHL games. This sounds pretty grim for a career outlook. Things didn’t get much better to start this season, and Tinordi was waived by the Penguins in September before the season started. On top of that, Tinordi managed to injure himself in training camp and missed all of October. The Habs and Coyotes clearly thought Tinodri was a bust. Yet, GMJR clearly is willing to give Tinordi another look, at least in the minors. Pittsburgh has had luck with cast off parts before. Cole, Kessel, Hagelin, Schultz, and Daley changed when they became Penguins. Perhaps Tinordi is the next to join the club. The good news for Pens fans far and wide is that it looks as if Rutherford’s latest reclamation project is progressing quite swimmingly. Tinordi is now starting his AHL season in November. He has played only 4 games for WBS, but his presence is already turning heads. Tinordi looks like an NHLer. 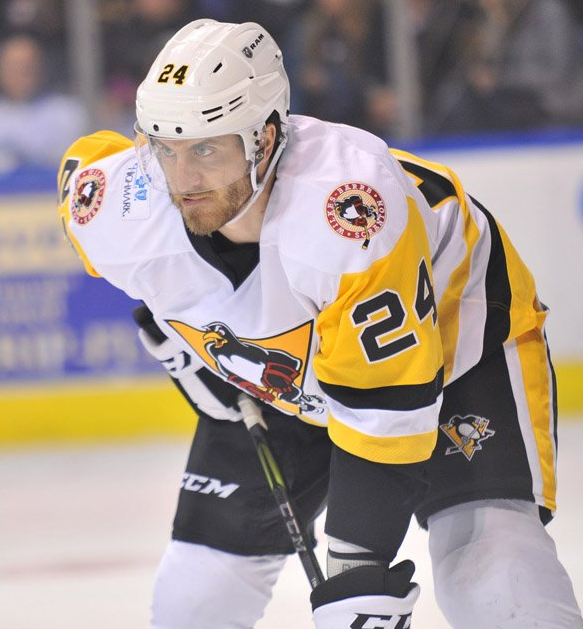 Like Tom Sestito, Tinordi looks like a giant among the rest of the WBS players. He has the size (6’5″, 230 lbs) to be in the NHL. Tinordi also has hockey sense and offensive instinct. He looks light years ahead of Derrick Pouliot. He is already showing that he has the skating ability to be an offensive defensemen in the NHL. Check out this goal against the Hershey Bears. 🚨 GOAL! 🚨 @jarredtinordi5 gives the #WBSPens a 1-0 lead in Hershey! Goals in back-to-back games for Tinordi. You won’t see a better example of a defenseman jumping into the play and driving to the net through traffic in the AHL. He also has a booming shot from the point. Check out this goal against the Providence Bruins. 🚨 GOAL! 🚨 Jarred Tinordi ties it for the #WBSPens! His first goal in over a year. 2-2. WBS has been missing a defenseman like this that can really make plays and has a solid scoring touch since David Warsofsky left last season. I would expect to see Tinordi more on the point on the first unit of the WBS powerplay in the games coming up. Although his season is just starting, Tinordi seems to be well on his way to moving up to the NHL. It shouldn’t be surprising if his name is just another added to the list of players who have successfully rehabilitated their damaged career within the Penguins organization.